JOIN THE HR POWER HOUR MAILING LIST! on the Lobster Network Flagship Station! Allie believes that health is multi-dimensional, individual, and requires diligence. So much more than what we eat or how much we move, our level of wellbeing at any given time is defined by how aligned we are with our values – in thought, belief and behavior. Allie was introduced to the world of holistic health and wellness through the lens of yoga. After almost 10 years of practice, Allie received her Yoga Teaching Certification in 2012 from the Association for Yoga and Meditation in India. Since then, Allie has undergone additional trainings in both Yoga Anatomy and Adjustments at Kripalu Center for Yoga and Health. 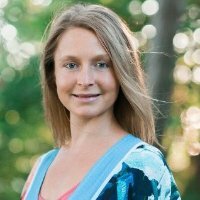 Allie started OmBody Health (previously Maine Wellness Partners) in 2014, the same year that she received her Health Coaching Certification from the Institute for Integrative Nutrition in New York City. Since then, Allie has devoted herself to supporting individuals and companies in optimizing their health and potential. Allie is the primary Health Coach at OmBody Health, providing healthy lifestyle workshops, in addition to group and individual health coaching. Through her work, Allie supports her clients in articulating and achieving their version of optimal health by implementing lifestyle change that feels sustainable and aligned with their goals and values. In December 2016, Allie published her first book, a comprehensive self-care guide titled Wake Up! You’re Alive, But Are You Living? 40 Simple Self-Care Rituals for a Healthy, Abundant, and Purposeful Life. Allie is currently pursuing her Master’s Degree in Education with a focus in Corporate Wellness.